The NERF 2016 Rebuild & Trek programme is complete and the trustees couldn’t be more proud at the success of this project…. 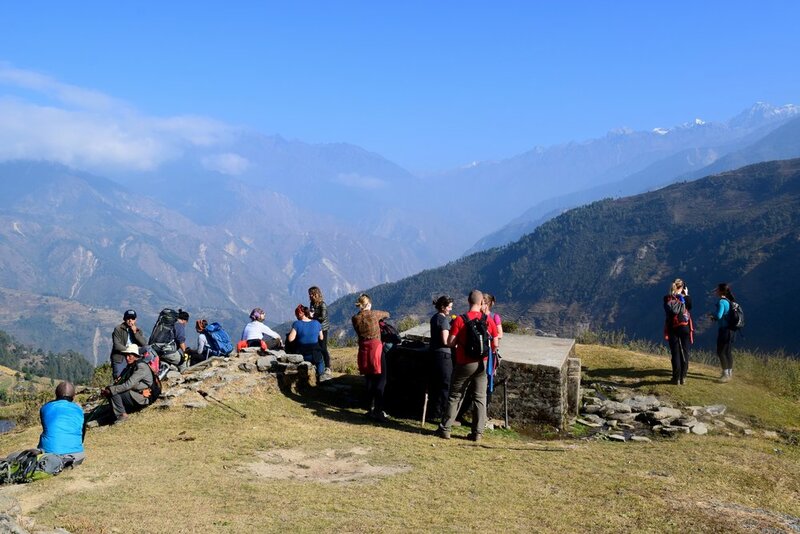 From 18 – 28 November 2016, eleven adventurous and altruistic individuals joined three of our trustees out in Nepal. 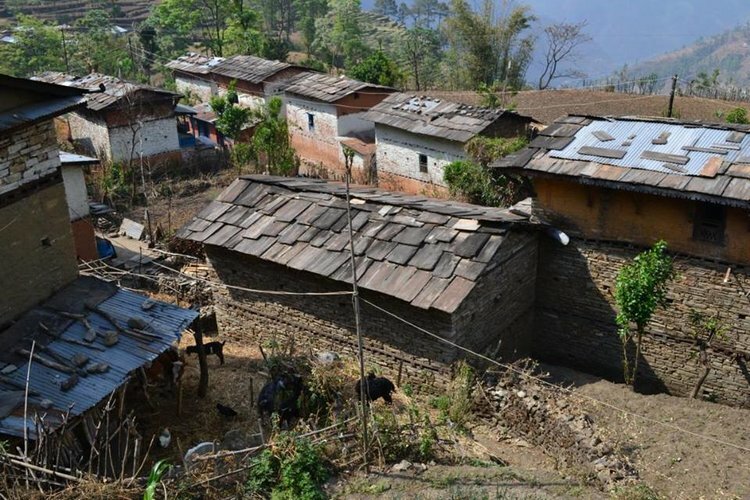 The aim: To raise funds and provide hands-on assistance rebuilding some much-needed infrastructure at one of our main partner villages in the Sindhupalchowk region of Nepal – one of the areas worst hit by last year’s earthquake. Before heading out to the Himilayan foothills, we began with two days sightseeing in the nation’s capital, Kathmandu. 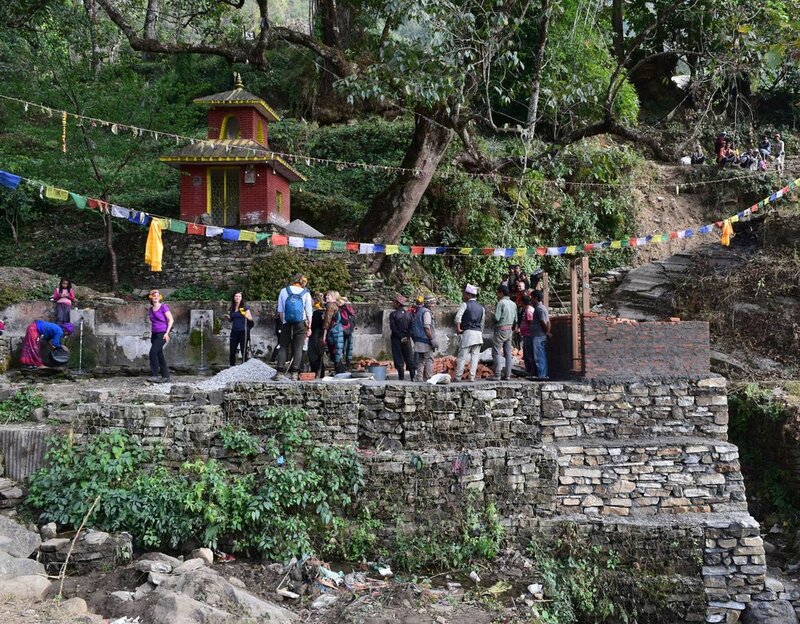 This provided a welcome opportunity for those on the trip to settle into the Nepalese way of life – getting used to the customs, the people, the food and the unique vibe! We visiting a number of important sites, including the Hindu Pashupatinath Temple and the Buddhist stupa Boudhanath. 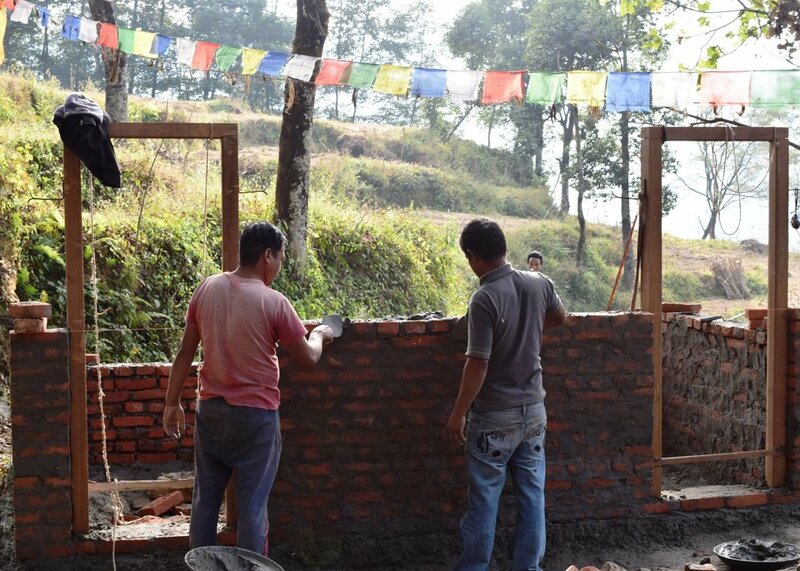 We spent three nights camping just outside the village, which allowed two full days of hands-on rebuilding work. 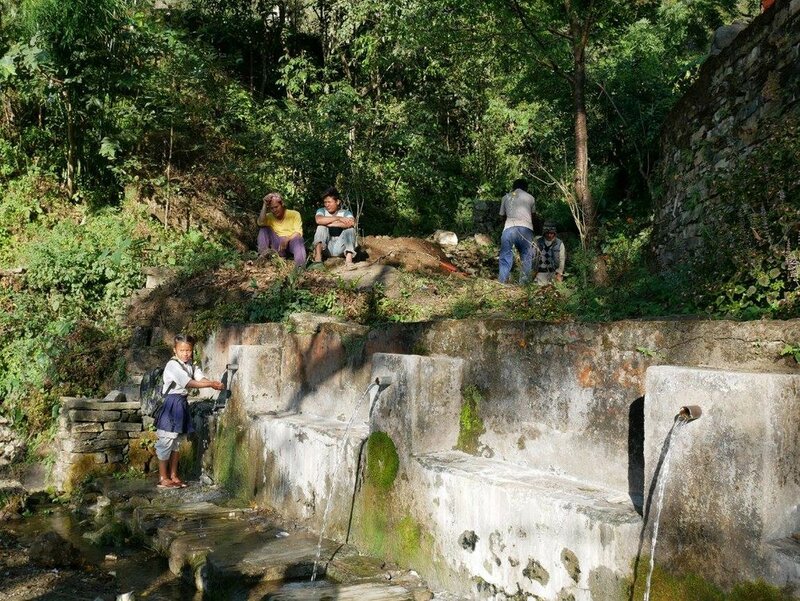 The trekkers had raised their sponsorship funds to pay for the materials and labour required to excavate a new water storage tank and build separate male and female changing rooms at the local water source. The entire village comes down here daily; to wash clothes, dishes and themselves – it is a vitally important part of the community. However, there are two major problems: A lack of water during the dry months, and no privacy to get changed. Our aim was to solve both issues. 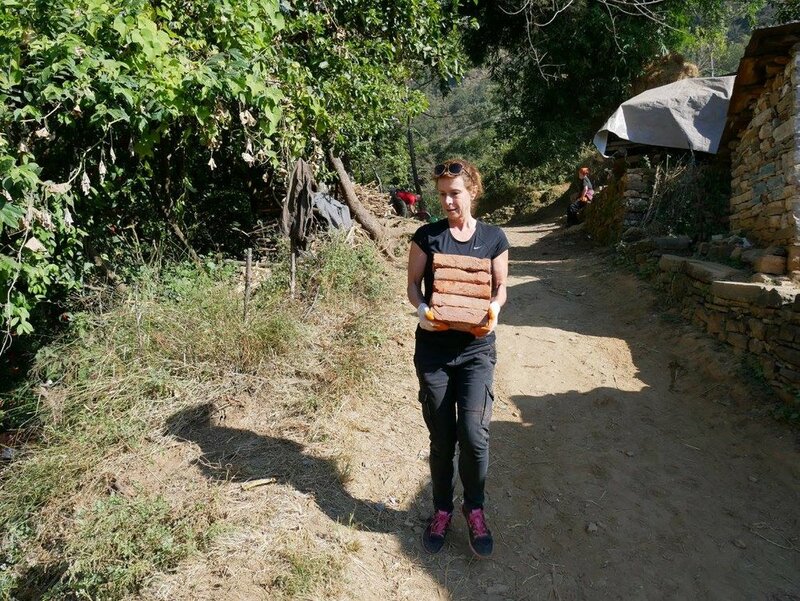 The team got stuck into the physical work immediately – there were 2200 bricks that needed transporting (by hand!) down to the worksite. The distance to cover was just right for a human chain involving all the volunteers and the first part of the day was spent linked together as one slick and efficient brick-moving-machine. 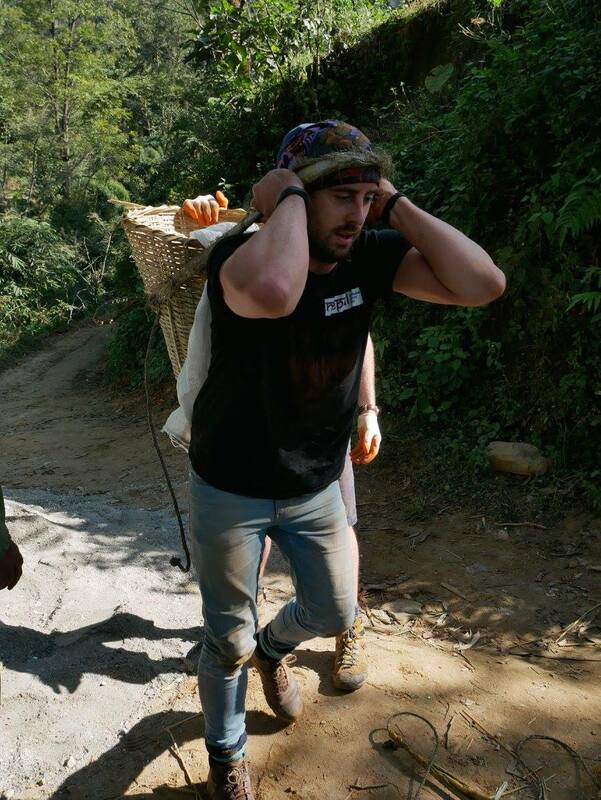 This was tough, physical, draining, dusty work. Retiring to the campsite after a long afternoon, we were rewarded with multiple courses of freshly-cooked grub, a few glasses of local moonshine and relaxing fireside storytelling. Day two, our focus turned from moving bricks to shifting the ton of sand that also needed transporting down to the main construction site. Sand isn’t the sort of material that can be passed along a human chain, so this time our volunteers had to rely more on brute strength as we filled and moved bag after bag of the finely-ground building material – some carried their bags the Western way, while others embraced the local technique by hanging a bag from the top of their head. Whatever works! 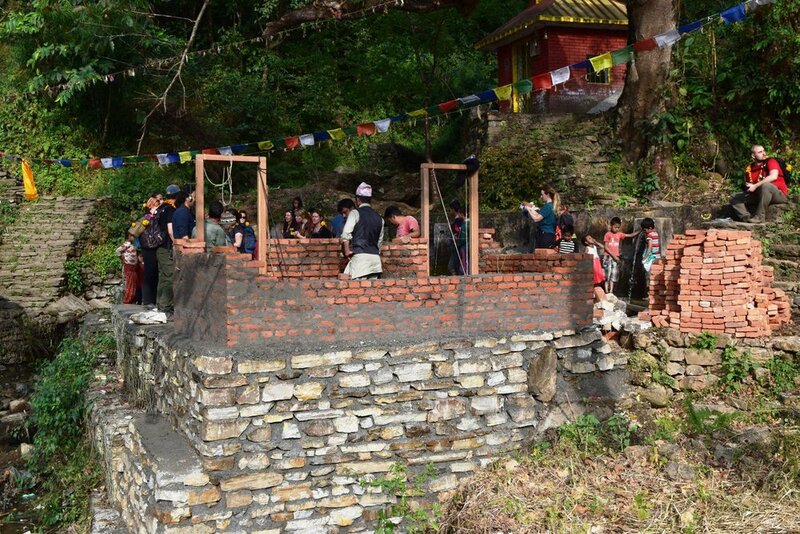 The locals were inspired by the great work ethic of our trekkers, and in turn felt motivated to double their own efforts on the construction work. This allowed more hands-on opportunities for some of the volunteers to grab a pick-axe or spade and put their back into earth and stone excavation to make some real headway into the immense hole needed to house the water tank. All the hard work really paid of: By the time we departed, the majority of the work was finished and in the days that have followed since, the work has been fully completed (more photos soon!). As the name ‘Rebuild & Trek’ suggests, the construction work was only half of the experience. 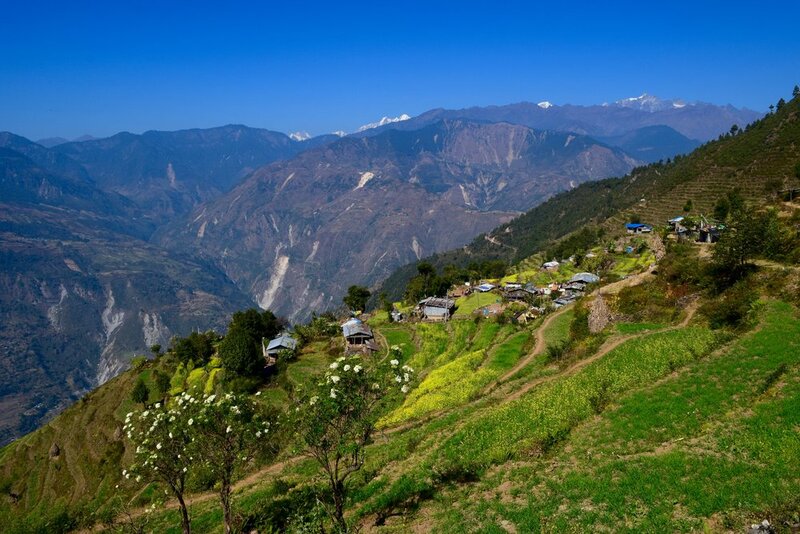 For the next three days we hiked further into the Himalayan foothills. Our new campsite was 1000m higher up with unbelievably beautiful views of the surrounding snowclad mountaintops. 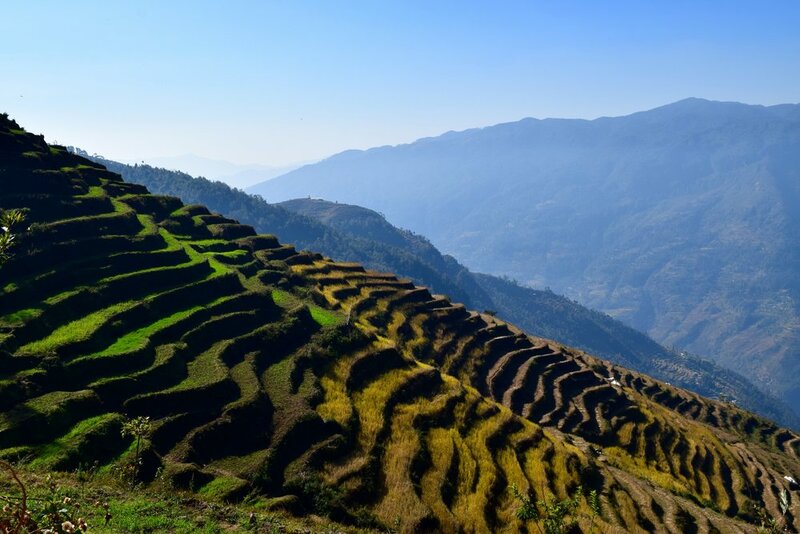 These final days were spent trekking through astonishing scenery – golden fields of millet crops interspersed with lush green plains, tree-covered hillsides and rocky outcrops. We visited several local villages – Mandra, Yarsa, Golchi – and in each and every one, the locals welcomed us warmly. Especially the children, who were always full of energy and ready to play! New and unexpected experiences were waiting to be found at every turn: A surprise wedding invitation, a raucous donated clothing auction, an eye-opening sacred shamanic ceremony. Each night the skies illuminated by roaring campfires and a million effervescent twinkling stars, seemingly close enough to pluck from the heavens. These adventures were constantly fuelled by far too much incredible food from our super-talented chefs, always topped off with lashings of moonshine, of course. As the trip drew to a close, there was just enough time for one final farewell party at a luxury riverside resort down in the valley bottom. Followed, of course, with the obligatory rushed Christmas shopping on the last afternoon back in the bargain-filled alleyways of Kathmandu. Friends made, lives changed, a positive difference made – our family of trekkers headed back home, already looking forward to joining again next year! We are currently working on the itinerary for the NERF Rebuild & Trek project for 2017. The dates will be similar (November) but full details will follow soon – watch this space! If you would like to express your interest early or request more details now, simply drop a line to james@nerfinternational.org.